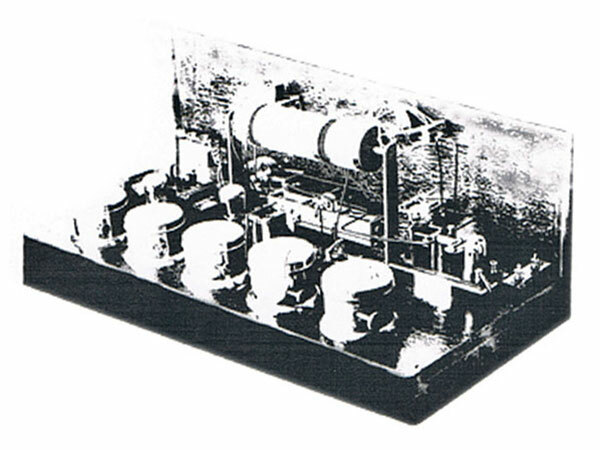 The receiver was a conventional Autodyne detector and two-stage audio amplifier. The second stage was of the push-pull type to provide high gain without needing a high-voltage power supply. The aerial circuit was fixed tuned, with only the secondary circuit being varied by the step-by-step (Teletuner) device. Along the back were the Siemens relays used for the remote control functions, i.e. battery charging, B battery charging, frequency change and filaments on/off. These functions were selected by three control lines linking the remote receiver to the Auckland Chief Post Office and from there to the radio cabin on the roof of the CPO. In the middle of the chassis, close to the front panel, was the latching relay Teletuner, giving control of the selected frequency. Immediately above was the variable condenser and tuning coil with aerial and earth connections on the front panel. To the left below the coil and partially obscured in the photo, were the valves, which (according to old timers) were probably Philips A609, 516 Series. The A battery (filaments) would have been six volts and the HT (B supply) between 100 and 180 volts. All external connections were made on the rear panel. Avondale remote receiver schematic, 29 July 1925. Click to enlarge. Avondale remote receiver control circuits schematic, 29 July 1925. Click to enlarge. The receiver was built at the Post Office Electrical Workshops in Newmarket. About 1948 I spoke to Ray Porteous (Electrical Supervisor at the workshops) who remembered working on the project and, after searching in various cupboards and boxes, found the remains of a latching relay. Before installation at Crown Hill a Mk 2 version was built, incorporating various improvements. * Morris, D.C. (2002). Auckland Radio, Alpha & Omega. Waitakere City, NZ: Copy Out West, p 16.